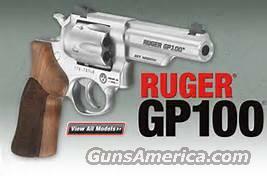 Description: Factory New & unfired Sturm Ruger GP-100 MATCH CHAMPION DA revolver in .357 Remington Magnum. Ready for competition. •Features a Hogue hardwood grip w/ stippled sides. •Patented grip frame design easily accommodates the use of a wide variety of custom grips. •Patented Ruger transfer bar mechanism provides an unparalleled measure of security against accidental discharge. •Triple-locking cylinder is locked into the frame at the front, rear and bottom for more positive alignment and dependable operation shot after shot. •The Match Champion Model is designed with the competitor in mind. With its ergonomic enhancements and tuned action, the Match Champion delivers fast, accurate shots and takes the popular GP 100 to the next level. It features a contoured cylinder, Novak Lo-Mount Carry rear sight and fiber optic front sight, Hogue hardwood grip w/ stippled sides and a slab-sided, half-lug target crowned 4.2" barrel. •Easy takedown of integrated subassemblies requires no special tools and allows for no hassle maintenance and assembly. •Satin Stainless Steel. 38 oz. 6-rounds. LAYAWAY price is $780 with PRIOR approval only. 120-days max. FIRST, please send message requesting layaway terms. No phone calls to start layaway process. KGP-141MCF. KGP141MCF. .357mag. .357 rem. mag. .357rm. .357 rm. target, range, self protection, personal defense. ccw, concealed carry weapon. 01754. champ. ss. sts.